Also, in Hancock, we went to that Peterson's fish mkt that Zimmern hit up in his U.P. show. The inlaws tested it first, and raved. There's the tiny market, and right behind it is the restaurant. The restaurant looks like a roadside fish shack out east, and it will not disappoint. The menu doesn't have much, but go with "Parmesan Crusted" anything, and the fish chowder with jalapeno emulsion. The Singapore Chili style fish prep is a red chile sauced piece of fish, and it's really not BAD at all. I wouldn't bother even trying it tho. It's pretty bland. I wouldn't get "fried" anything, either. Get Parmesan Crusted anything. It's throwback real butter, lemon, garlic, and parmesan cheese browned on top of FRESH fish, and it's OUTSTANDING. The Fish Chowder is decent by itself, but the "jalapeno emulsion" adds a warm, acidic, hit. It'll take your tongue three spoonfuls to get used to the vinegarry tang, but once you do, settle in, because you're gonna finish however much is in front of you. My GUESS is that they are using pickled jalapeno for the emulsion. Don't expect much from the fish market - their selection when I was there was about four diff types of fish fillets, and only two were local (you guessed it - lake trout and whitefish!) They also had a few types of smoked fish, and a freezer with shrimp and scallops. Don't sleep on either of these places. Kaleva's blueberry pancakes were out of this world. Thin, chewy, very crisp edges, and U.P. blueberries, which, if you have never had, might ruin you for commercial blueberries for the rest of your life. Not sure if the stars lined up for our pancakes, but it would seem to me that anyone that can make pancakes like this, must absolutely LOVE making pancakes. I've been assured that all of their food is way better than most in the area. Peterson's is a regular stop for us when we're in the UP. Good stuff. One of our daughters went to engineering school at Michigan Tech, so was in Houghton and the Keeweenau several times. Kaleva and Suomi were my preferred breakfast choices and while my daughter loved them, she was a regular at Vicki's, so we went there a fair amount as well. Hit Kaleva again, and the blueberry pancakes were exactly the same. I'm ready to call them the best I've ever had. Spent a good 4 weeks in the U.P. this summer, not much else new to report on so far. Much more smoking/grilling at home instead. Quite a few more long wknd trips coming up though. gleam wrote: UP wild blueberries are unbelievably amazing things. 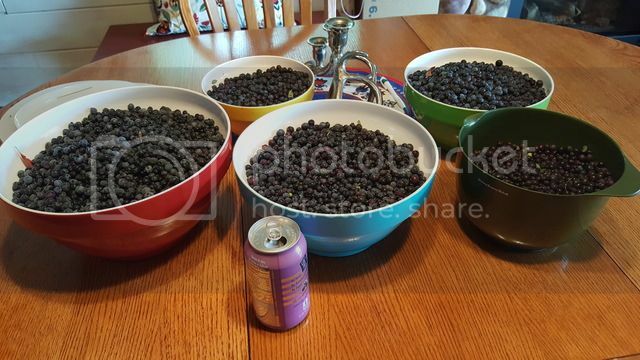 The best cultivated blueberries aren't even 1/10th as good as these wild blueberries. The haul from a few weeks ago. And no. I won't tell you where. Just like you wouldn't tell me where, either. I head up there every year for the demolition derby at the Iron County Fair and to visit my parents. For the 24 hours we are up there I cannot help but binge on Pasty’s. Bring home a cooler full of frozen as well. After all there are some good pancake places in Chicago (as well as being able to make some awesome ones myself). Similar to some friends (from Chicago) who recently went to Iowa and only ate at random Italian restaurants. Where is their Breaded Pork Tenderloin respect? Nothing fancy and not a dozen different flavors but a good, solid representation of the style. Always get it with rutabaga and always with ketchup. A few years ago I discovered that it is also traditional with brown gravy so I eat them now half and half. I’ve been eating them all my life and never tire of them. ... a term from Boy Scouts. ... where we not only had a meal but brought some fresh home to pay some respect to my dear departed uncle who taught me the secret of Wisconsin Style Beer Brats. I'll remember to grab a few extra pasties for you on our next run. We do a few runs every year. We get them from a church, and they do pasty/potato sausage fundraisers several times per year. Their pasties have a crunchier crust than most (suet is used.) I'll throw you a few frozen ones since you are a connosieur. I can't go back to eating the soft crusted ones. Please do, I would live to give them a try!!! Hey! Potato sausage, that sounds Lithuanian. ... and googling the name I see there even some up near Rockford, IL. This is much closer to what Arby’s should be. Tender, juicy beef with an actual roast beef flavor. I usually forget and after a pasty meal I end up having a second meal. We'll just say the fries are damn good. It is ‘low’ eating for sure and never a destination.